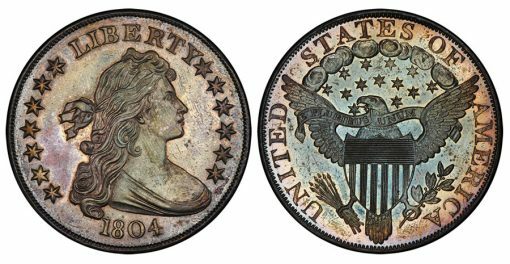 U.S. rare coins selling for $50,000 or more and those selling for $500 or less generally did well during 2017, according to the Professional Numismatists Guild (www.PNGdealers.org), a nonprofit organization composed of many of the top rare coin and paper money dealers. Four historic, vintage U.S. coins sold for $1 million or more during the year; two at public auctions and two by private transactions. The PNG estimates the overall U.S. rare coin market in 2017 was between $3.4 and $3.8 billion, not including sales by the United States Mint or bullion coins, such as gold and silver American Eagles. The aggregate prices realized for U.S. coins sold at major public auctions in 2017 totaled $306,199,305. Two auction houses accounted for nearly 80 percent of the overall total with Heritage Auctions reporting $169,100,000 sold at auction and Stack’s Bowers Galleries at $74,099,305. Stack’s Bowers sold at auction an 1804-dated U.S. Class I silver dollar for $3,290,000 and a 1794 silver dollar for $2,820,000. All totals include the buyer’s premium to reflect the actual, full prices paid by winning bidders. "Over the decades, the rare coin market has moved in cycles," explained PNG President Barry Stuppler. "High-grade, historic coins valued at over $50,000 and so-called ‘collector’ coins under $500 generally did well in 2017. Unlike the last few years, there were few old-time collections that came into the marketplace, and some of the investment money that may have gone into numismatic purchases went into the booming stock market and the speculative cybercurrency market," said Stuppler. "Despite that, demand for extremely rare investor-collector coins rose in 2017." The Professional Numismatists Guild was founded in 1955. PNG member-dealers must adhere to a strict code of ethics in the buying and selling of numismatic merchandise. For additional information about the PNG and a complete list of member-dealers, visit online at www.PNGdealers.org or call the PNG headquarters in Temecula, California at (951) 587-8300.